Staples #25 Patrick Lesch gets close to the goal as Staples High School hosts Fairfield Ludlowe High School in varsity football in Westport, CT on Fri. Oct. 11, 2013. WESTPORT -- For the second straight week, the Staples football team struggled in the early going, struggling to find consistency on both sides of the ball. And for the second consecutive game, the Wreckers executed flawlessly over the final 24 minutes, putting away a feisty opponent to extend their winning streak to four games. Patrick Lesch scored three touchdowns for the second straight week as Staples used a big third quarter to pull away from Fairfield Ludlowe 52-23 on Friday night. "We were taking on a little water in the first half there, you can't give away points," Staples coach Marce Petroccio said referring to a pair of first-half turnovers. "I think we knew we could run the ball on (Ludlowe) and that's what we did in the second half." Lesch (17 carries, 134 yards) and Jack Greenwald (7 carries for, 106 yards) formed a dynamic duo in the backfield for the Wreckers (4-1, 4-0). "It's amazing to have two great running backs," Staples' WR Will Johnson said. "Sometimes (teams) will key on Lesch and then you have Greenwald, who played an unbelievable game. It definitely makes it a lot easier." The Wreckers took over in the third quarter. After stalling a Falcons drive at midfield to open the quarter, Johnson took the ensuing punt 80 yards for a touchdown. The senior evaded a handful of Falcons defenders, who couldn't tackle him despite having him surrounded, for the score. "The play was to go to the right and the punt went all the way to left so I didn't know what to do," Johnson said. "I saw one guy and tried to make him miss and there were some good hard blocks and I was able to make some moves and score." On the Falcons' next play from scrimmage, QB Matt White bobbled the exchange with his running back and Staples pounced on the ball. Lesch was in the end zone for the third time four plays later. Wreckers quarterback Jack Massie, who shook off two early interceptions, found Jake Melnick for a 42-yard bomb later in the quarter to put the game away. Petroccio felt the big punt return set the tone for what was to come. "(Johnson) lit the match," Petroccio said. "Will Johnson is a special kid. We needed that bad; it opened the floodgates and away we went." The Falcons kept pace early behind the arm and legs of White, who carried 13 times for 105 yards and a touchdown in the first half. His 28-yard scamper in the second quarter brought Ludlowe to within 17-10 and an interception return made it 17-16 at the half. 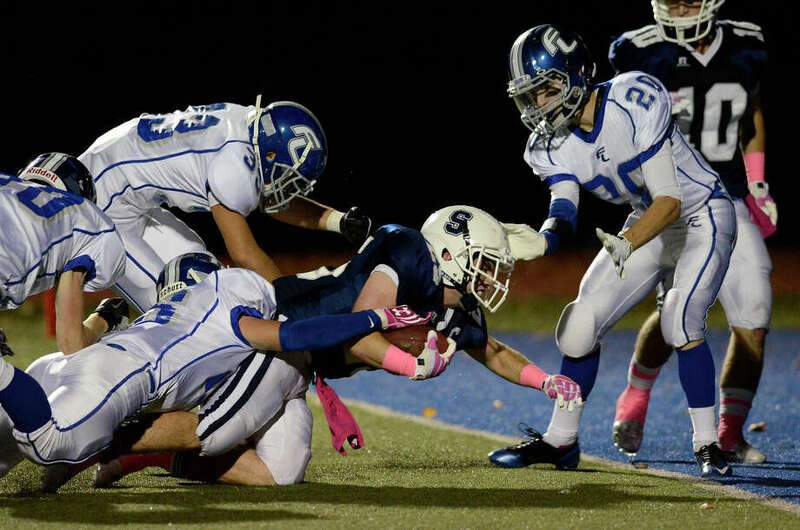 "(White) is a heck of an athlete, (Ludlowe) is a program that is on the way up," Petroccio said. "Hopefully we can hold them down for a little while longer, but they did a great job and played their tails off." The biggest stat that turned the tide against the Falcons: turnovers. Ludlowe didn't commit a single turnover in the first half, but accounted for three in the second. "They were huge," Ludlowe coach Vin Camera said. "We won the turnover battle in the first half and it's essentially a tie game. In the second half (Staples) won the turnover battle and they won the game."